Last year I made some hot cocoa cookies and they were so much fun, I knew wanted to make more, but in a different design. I was still charmed by the red/turquoise color combo, so knew I would stick with that, but in reverse (cup=blue, details=red). I found a cute cookie and yummy recipe at Land O' Lakes, then decided that I wanted to use the recipe, but substitute royal icing and a different cookie design. I made the dough and put it in the fridge for a couple of days while I thought about the cookie...Then, I remembered a cute cookie I had seen in Bridget's (Bake at 350) book, Decorating Cookies! I ran to my kitchen and there it was on page 136-137, Mugs of Cocoa cookies! :) Woo hoo! I made the template from the book on heavy paper and cut out all of my cookies with a small, sharp knife. Bridget's directions (and step-by-step photos) were so easy to follow and I was giddy with how the cookies turned out! I added some additional details (snowflakes, heart, whipped cream, sprinkles) and then did the happy dance:) Thanks Bridget! Stir together flour, cocoa, baking soda and salt in bowl; set aside. Beat sugar and 1 cup butter in large bowl at medium speed until creamy. Add egg and vanilla, beating until well mixed. Gradually add flour mixture, beating at low speed after each addition. Divide dough in half; wrap each in plastic food wrap. Refrigerate at least 2 hours or until firm. Heat oven to 375°F. Line cookie sheets with parchment paper; set aside. Roll out dough to desired thickness (I roll out 3/8-inches), and cut out using a template or cookie cutter. Bake for about 15 minutes, or until set. Let cool. These cookies are very chocolatey and yummy! I am pinning these! They are ADORABLE!!!! What a cute idea!!!!!! 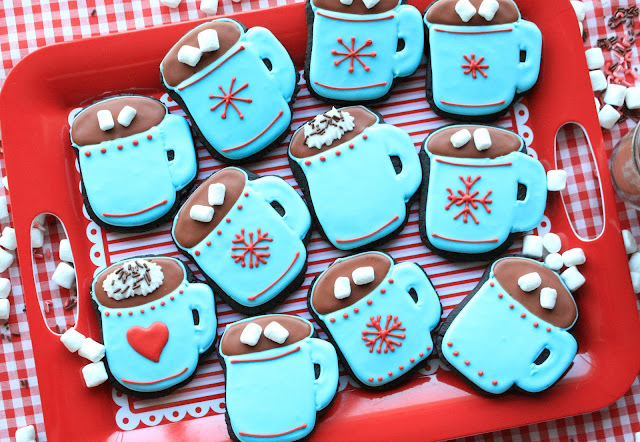 Chocolate cookie dough is the perfect dough for these cute cup-o-cocoa cookies! These are so pretty..love them! Those are so, so pretty!! You make the cutest, most beautifully perfect treats! 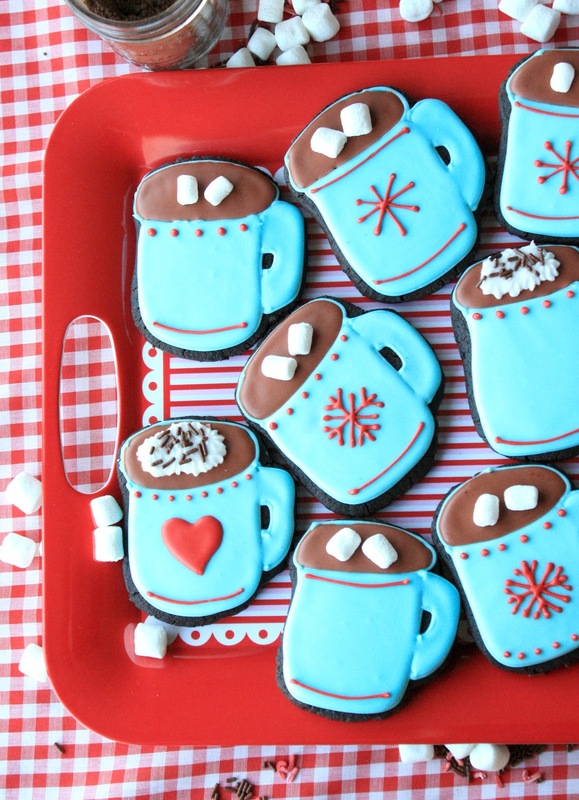 I love your cocoa cups - perfect for me - I love cookies more than hot chocolate! The colors are some of my favorites! Wow, so pretty Sue. You still amaze me each time with your talent, you make cookie decorating look so easy. I love the colours too and the fact that these are chocolate too. In fact, I may use your chocolate sugar cookie recipe and add a touch of peppermint extract for that minty kick. I was scrolling through your blog with my little nephew on my lap..and when he saw these gorgeous hot chocolate cookies..he put his little index finger on the screen, eyes wide..and gasped in awe :) That's exactly how I feel!